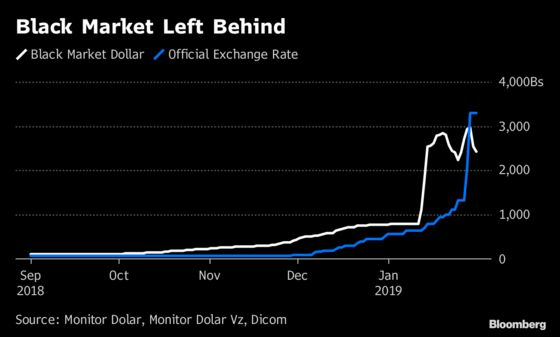 (Bloomberg) -- Even in the upside-down, topsy turvy world that is Venezuela, where dueling presidents reign and cash has become so worthless it doubles as confetti, this one is pretty weird: The going black-market price to buy dollars is lower than in the officially sanctioned government market. It isn’t entirely clear what caused the reversal of the long-time dynamic, in which strict government restrictions pushed those who couldn’t access the official rate to pay a premium that sometimes approached 20-fold on the informal market. But it appears there’s been a collapse in the supply of dollars -- or a spike in demand for them -- from the small group of companies and individuals that have access to the central bank auctions, sending the rate plummeting 52 percent this week alone and 83 percent in January. In the black market, a dollar costs 2,500 bolivars, according to MonitorDolarVz, compared with 3,295 bolivars at the government rate. The government has been trying to stamp out the black market for years, blaming it for price distortions that made shopping trips to the super market incredibly complicated. Now, the higher government rate means that for once, everyday Venezuelans aren’t getting a bum deal because they don’t have access to the government’s friends-and-family rate. One potential influence on the foreign-exchange rate is that after a decade of strict controls, Venezuela’s central bank unexpectedly introduced Interbanex, an online foreign exchange platform tailored for private clients, last weekend. The exchange platform is owned by Spain’s Ampajesu, which controls a 62.5 percent stake. Bull Equity Management Ltd. set up in Barbados, controls the remaining stake. Venezuela’s ruling socialists have struggled to tame hyperinflation and address a general collapse marked by widespread hunger and an outpouring of peoples from what once had been one of Latin America’s most affluent countries. Dogged by economic sanctions and a crumbling oil industry, Maduro lopped five zeros off the bolivar last August in a bid to ease transactions and stabilize the currency. The late President Hugo Chavez began limiting money-changing in 2003 in a bid to stem capital fight, but in the years that followed, the exchange regime engendered widespread corruption and starved local industries of hard currency needed for imports. The current market inversion doesn’t figure to last long. Those buying dollars now in the official market will presumably just migrate into the black market, which should, in theory, wipe out the price difference.